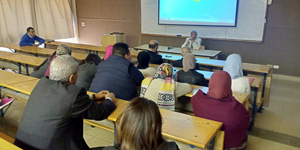 The faculty of Languages and Translation held a seminar entitled “The Second Battle of El Alamein: A Turning Point in the North African Campaign of the Second World War” on Tuesday, 12 March, 2019. The seminar was given Mr. Salah Younis, a Lecturer of Italian Language. This was held from 12.30 pm to 2.30 pm – room D312 at the Social Studies and Humanities Building. The seminar was attended by academic staff members and 20 students.